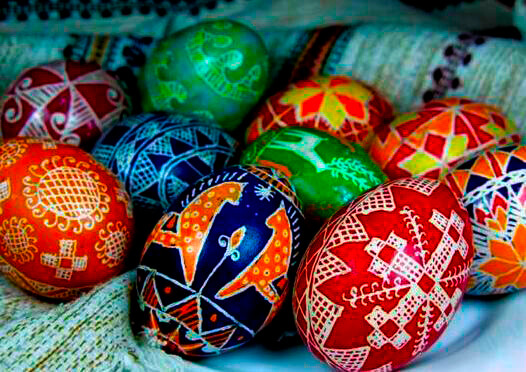 From ancient times, in every region of Ukraine, there were specific traditions to create pysanky (Easter eggs decorated with the batik method). 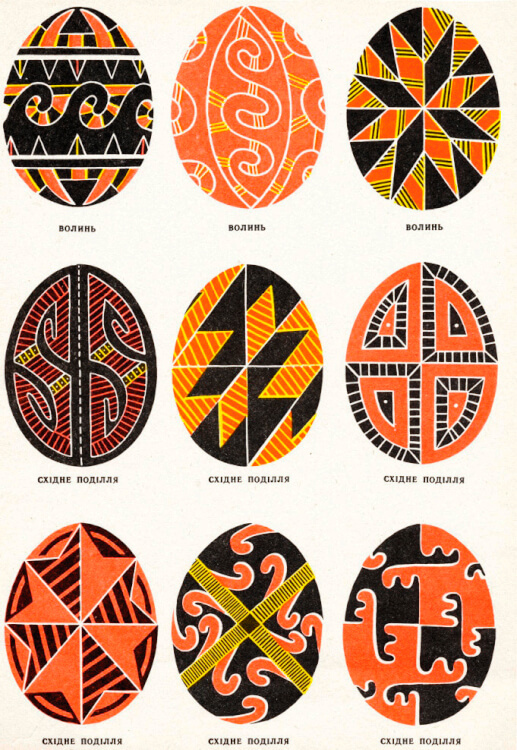 One look at a pysanka was enough to say in what region the Easter egg was made and what exactly the author/creator wanted to say (some of Easter eggs told the whole life stories of a person or an entire family). 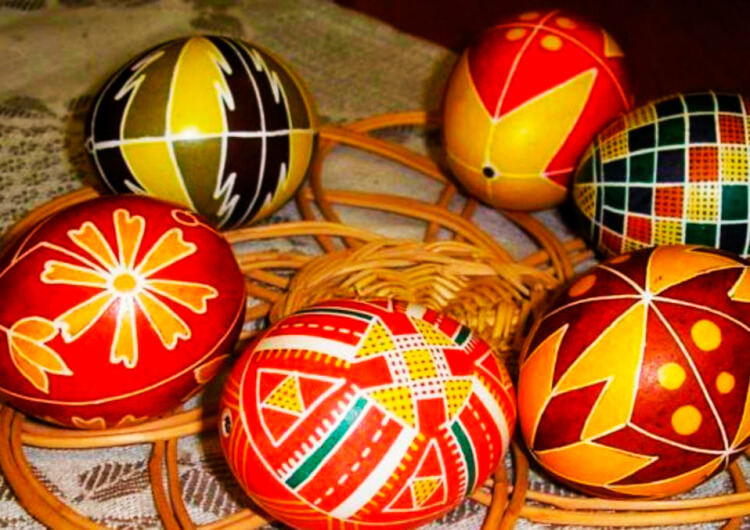 So what were the differences between pysanky of different Ukrainian regions? 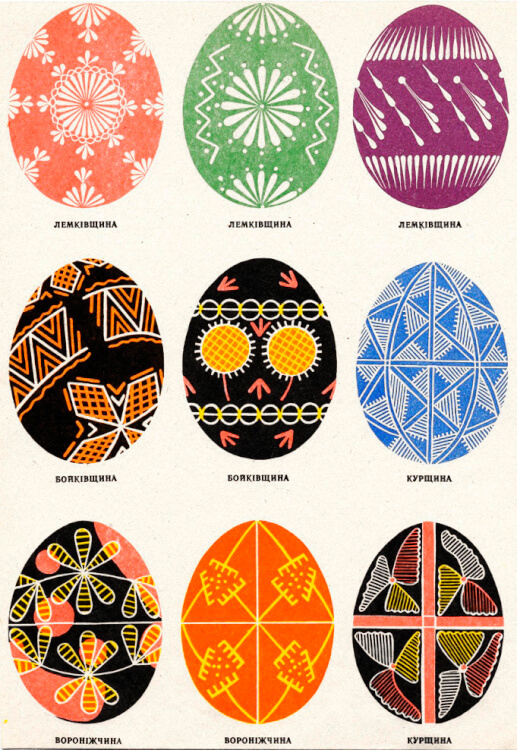 Here are classic examples of Easter eggs that are typical to various areas of Ukraine and which can now be seen in museum exhibitions and, sometimes, at Easter festivals. 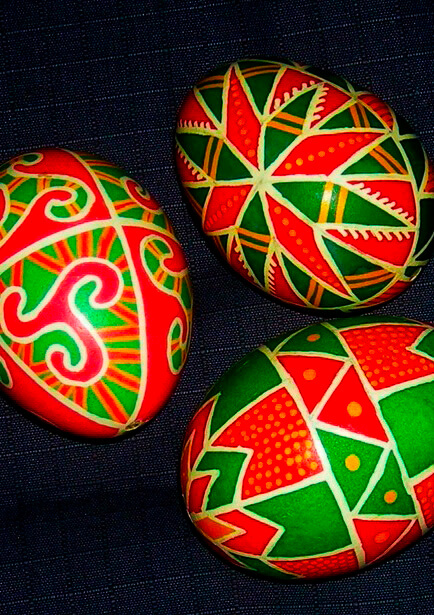 In Lemkovyna region one-and two-colored Easter eggs were widespread. 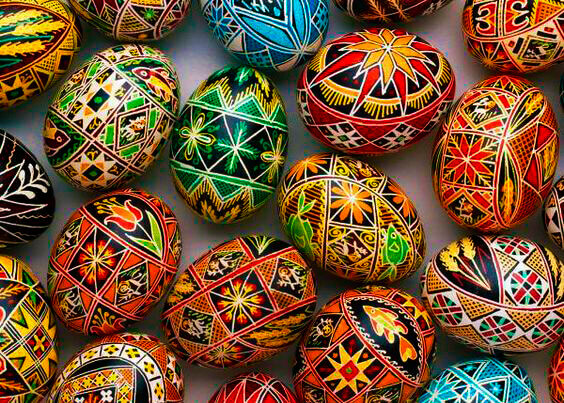 The eggs were dyed in red, yellow, orange, green, blue and white colors (the black color was almost never used). 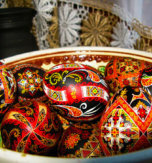 The sun, stars, crosses and roses were depicted on pysanky. 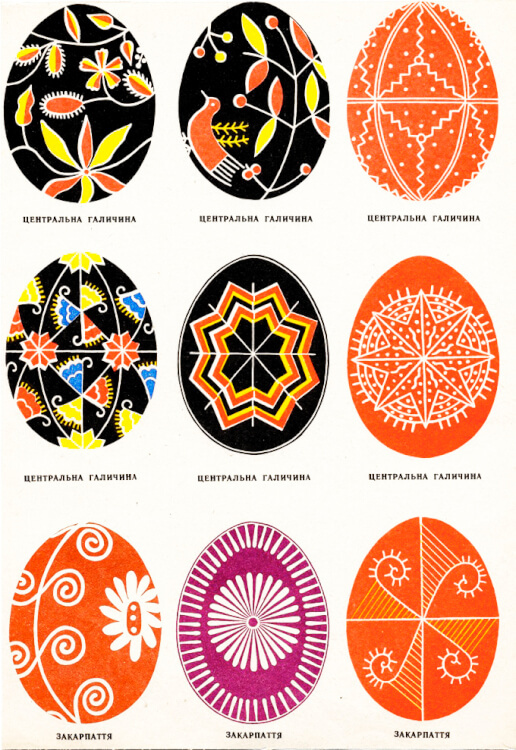 On the Easter eggs on Boikivshchyna there were depicted up to 100 variations of drawings: stars, doodles, spirals, etc. Each symbol had its own meaning. For example, doodles and spirals symbolized the "thread of life (fate), life path" and the eternity of the sun’s motion. 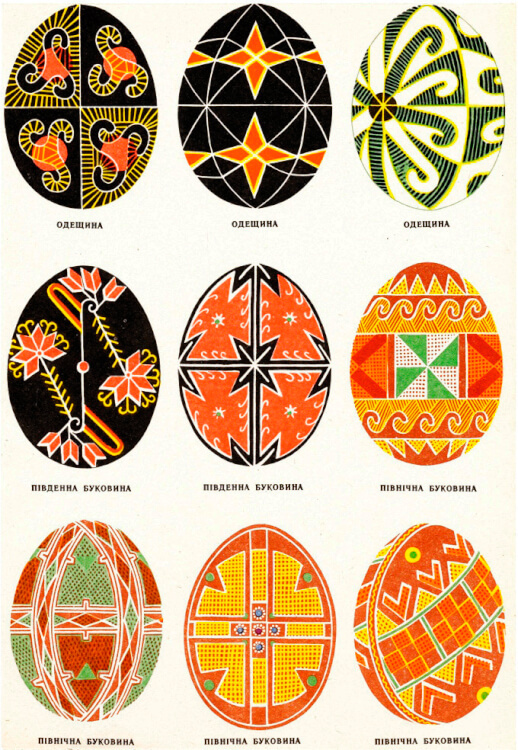 Pysanky of Hutsuliia were believed to be the most informative - they can “house” the whole story of a human’s life. 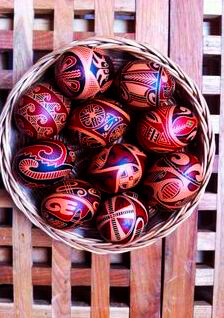 Initially, Hutsul pysanky had an orange color. Later, they were also colored in blue, red, pink, and purple. Each color had symbolic meaning: black symbolized earth, red - life, strength, health and love, white - purity and holiness, yellow - sun and abundance, green - spring and the awakening of nature from winter sleep. 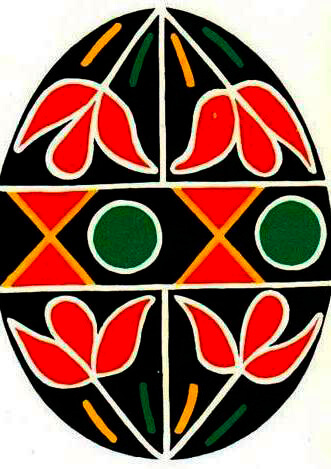 Among the drawings on the Hutsul pysanka you can find a cross (symbol of God), a triangle (symbol of a married couple), a ladder (symbol of aspiration to self-improvement), a tree (symbol of a tree of life or family tree), and also animal and vegetable motifs: oak leaflets symbolizing force and spikes symbolizing abundance and good harvest. 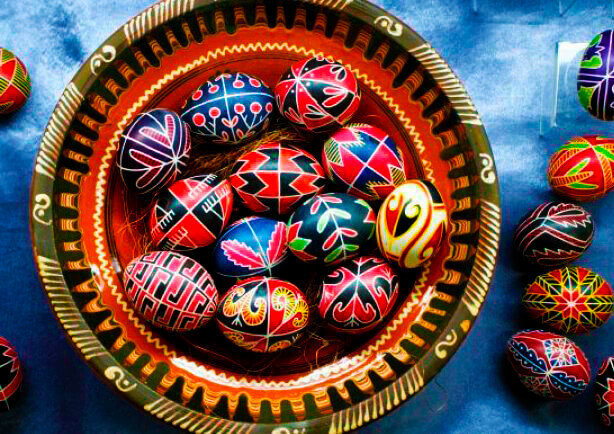 Hutsul pysanky are distinguished for their subtlety, tenderness and miniature. 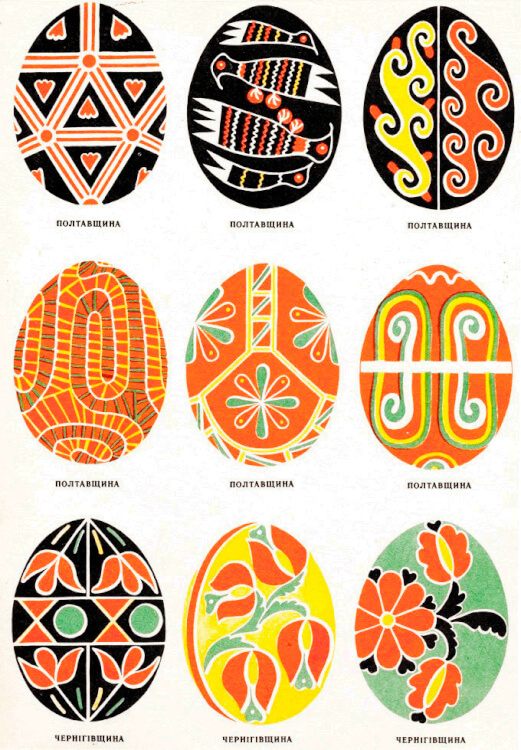 Kosmatski Easter eggs represent a more colorful variety of Hutsul Easter eggs. Traditionally, they were decorated with geometric patterns combined with the tree of life (a branch with birds), Hutsul hut, horses, butterflies, fishes, and the like. Roses were also drawn on pysanky of this region. 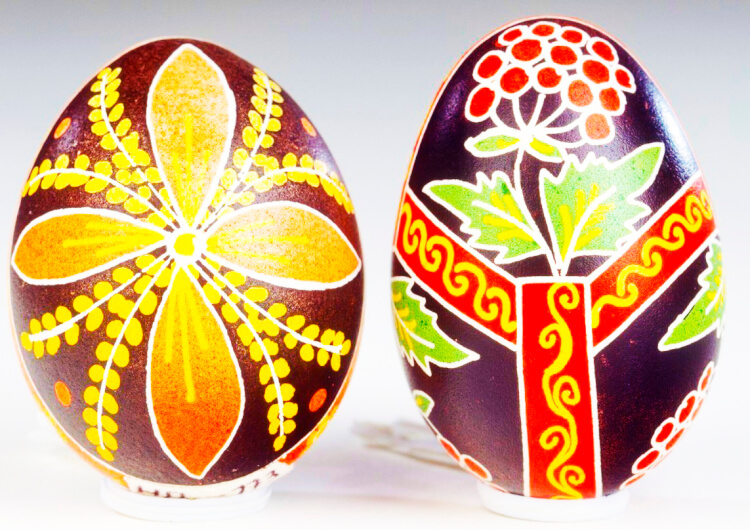 Pokutski pysanky have large drawings with floral motifs and lines that divide the egg into a half or into smaller pieces. 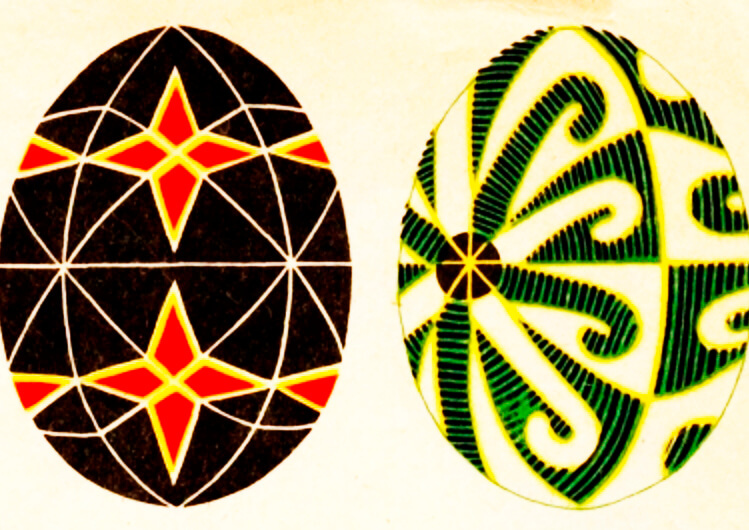 The eggs feature green, blue, red, brown or yellow background. 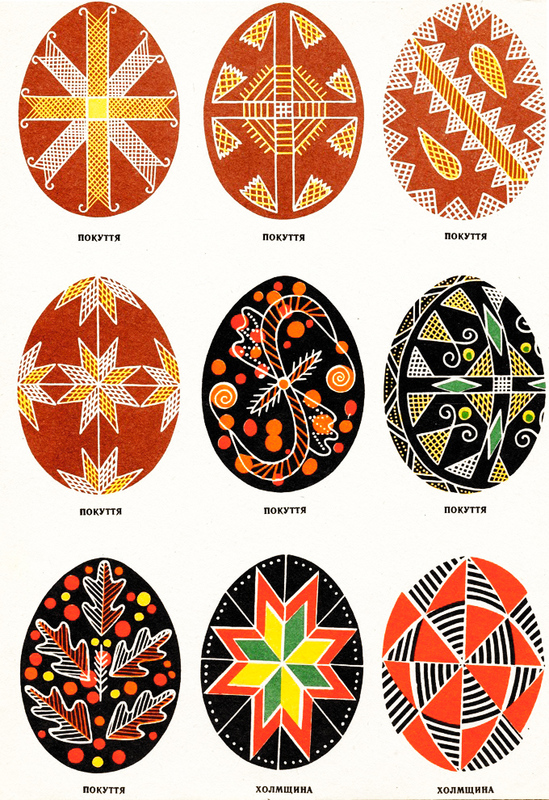 The distinguishing feature of these Easter eggs is the bright contrasting spots on the entire surface of the egg. In Bukovyna, geometric drawings of a fairly large size were popular. 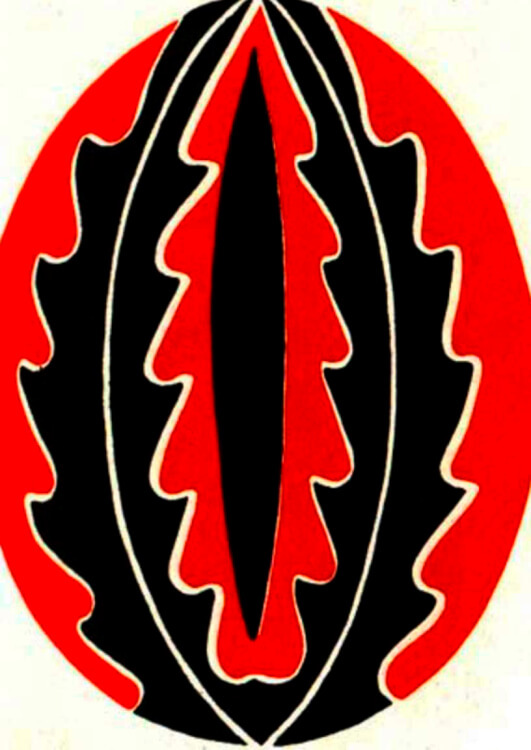 Among the used ornaments were stripes and rosettes placed on a dark red or black background. 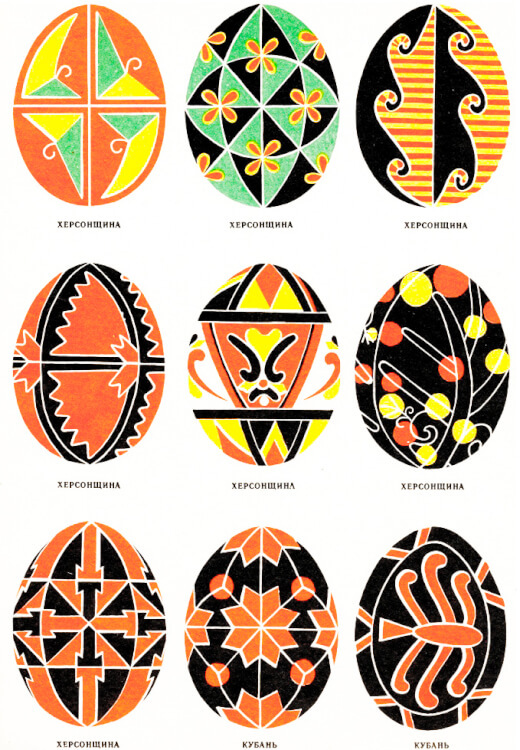 Subcarpathia Easter eggs have a yellow, orange and black color. 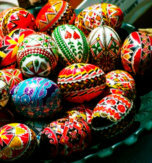 Pysanky were decorated with churches, crosses, and crucifixion with a schematically depicted man. 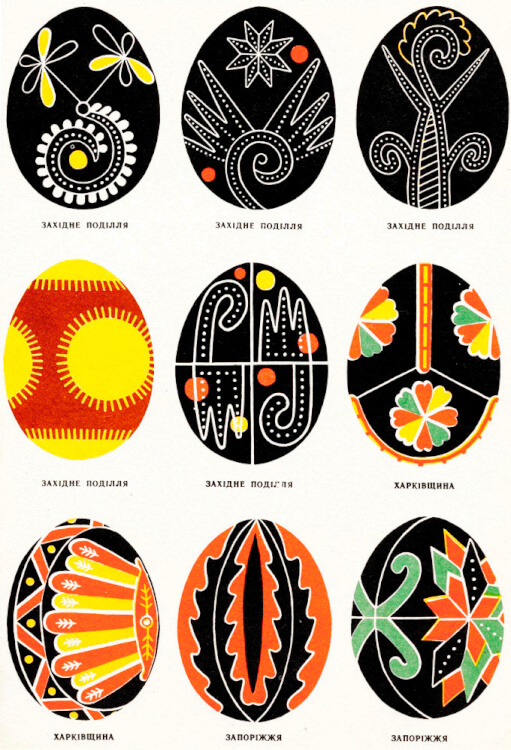 Sokalski pysanky are distinguished by detailed motifs mostly floral ones, drawn on a red, black, dark green or lilac background (sometimes drawings are made above unpainted eggs). Among popular ornaments are oak leaves, crochet crosses, lattices, little suns, windmills, butterflies, etc. In Podilia region dark-colored pysyanky were widespread: black, violet and brown. Patterns were of quiet tints of black, red, and white (sometimes yellow and green). Among the ornaments, we can see geometric, floral and animal motifs: oak leaves, chicken legs, turtles, etc. Pysanky made as gifts also had special wishes. 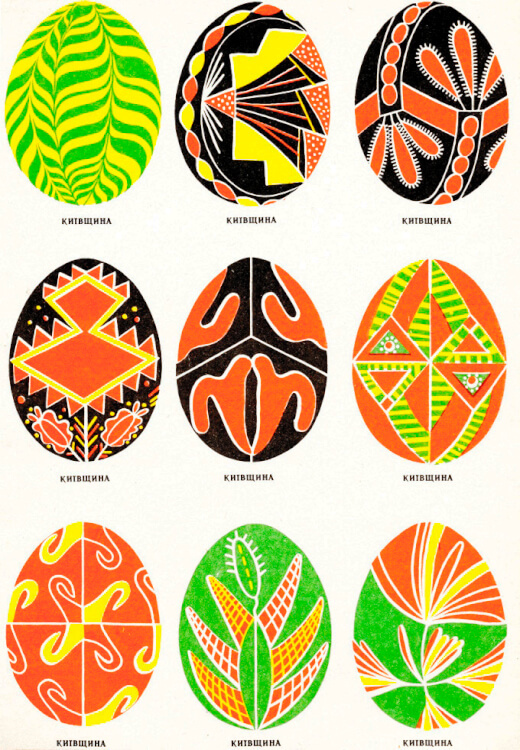 For example, Easter eggs made for children were decorated with flowers and butterflies, the ones for grain growers were adorned with spikes as a symbol of a good harvest. 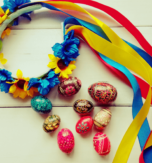 In Black Sea coastal area, the most popular colors for Easter eggs were the combination of blue and green, red and black, as well as yellow and green colors. 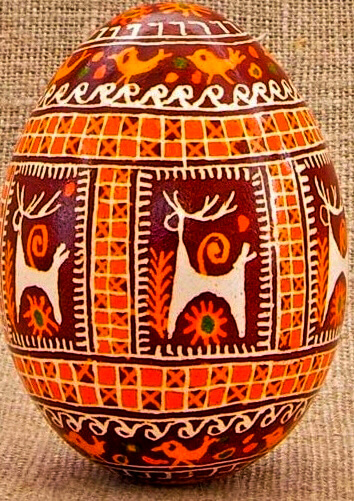 Ornaments were most often geometric and floral. 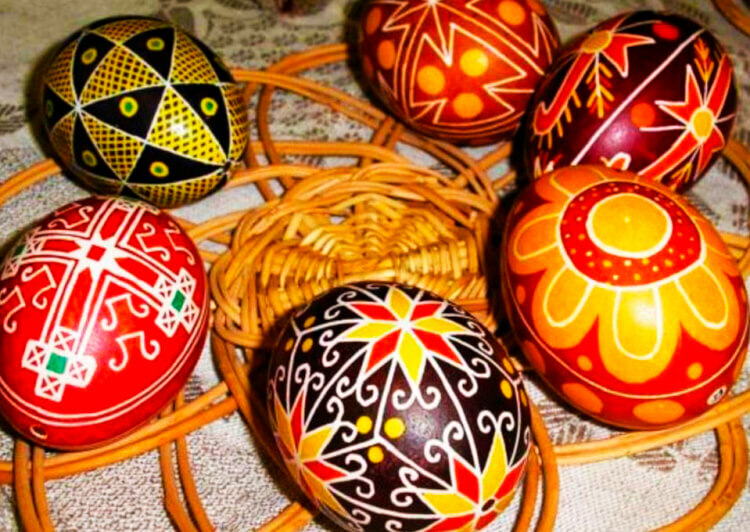 In the Dnieper Ukraine, Easter eggs were decorated with floral motifs on black, dark cherry, red, and sometimes a green background. 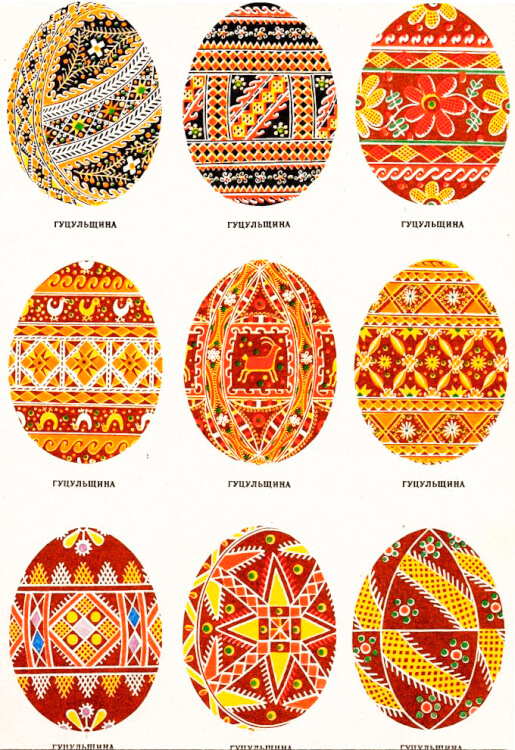 Pysanka was divided into fields and decorated with full-blown flowers in white, yellow and red colors. 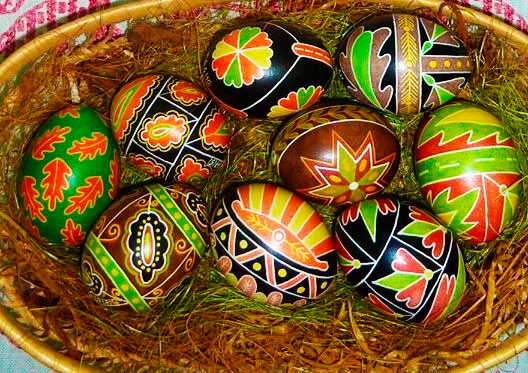 Pysanky of Poltava region were of white, yellow and green colors with red, brown, black and green ornaments. The main motive was the floral one. The images of people and animals were also presented. 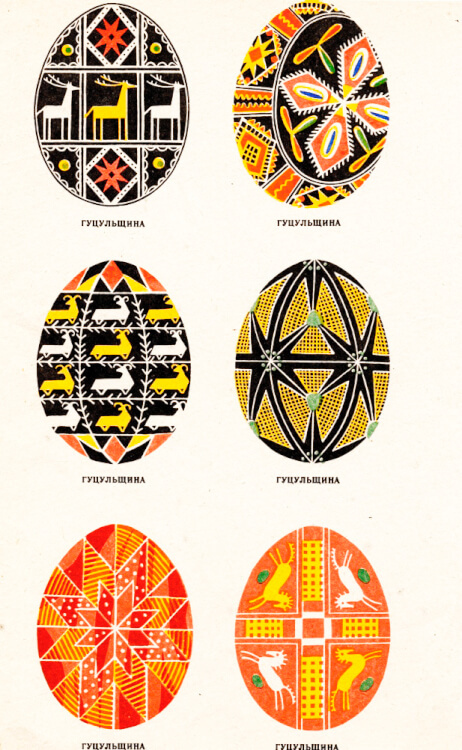 Pysanky from the Kyiv region are somewhat similar to Easter eggs from Poltava, but here geometric motifs (triangles, stars), animal (chicken legs) and flower images are more common. The ornaments feature more saturated colors and have a quite large size. 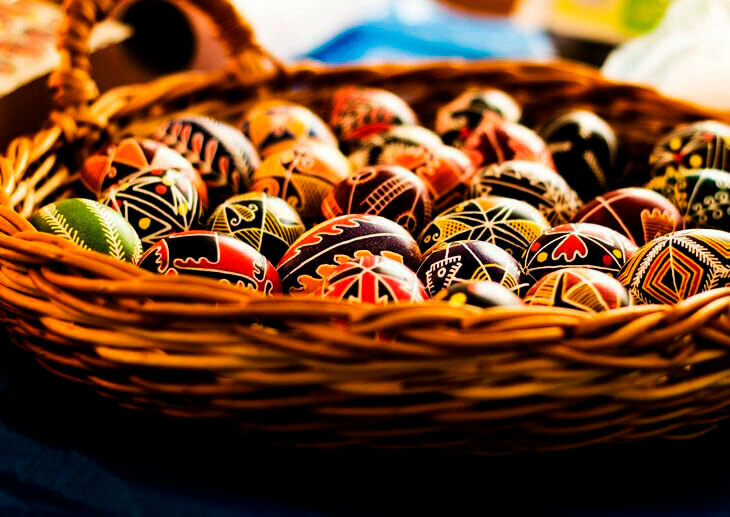 Kyiv pysanky are distinguished for bright images of solar signs and floral motifs. 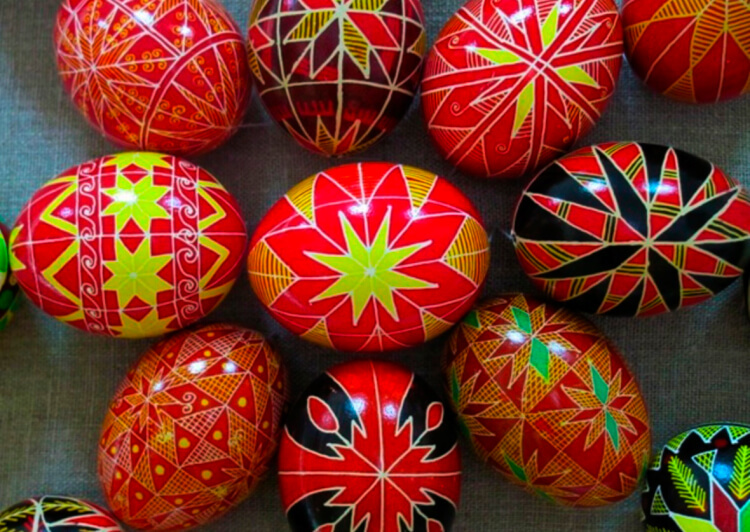 In Chernihiv region pysanky of white, red and black color prevail. Among the ornaments, we can see solar and floral motifs (geometrical are almost not found). Hops, roses, waves and the like are also depicted. 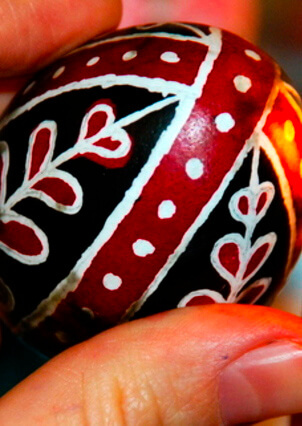 Pysanky of Zaporizhia region are adorned with floral motifs depicted by broad lines of black and red colors. 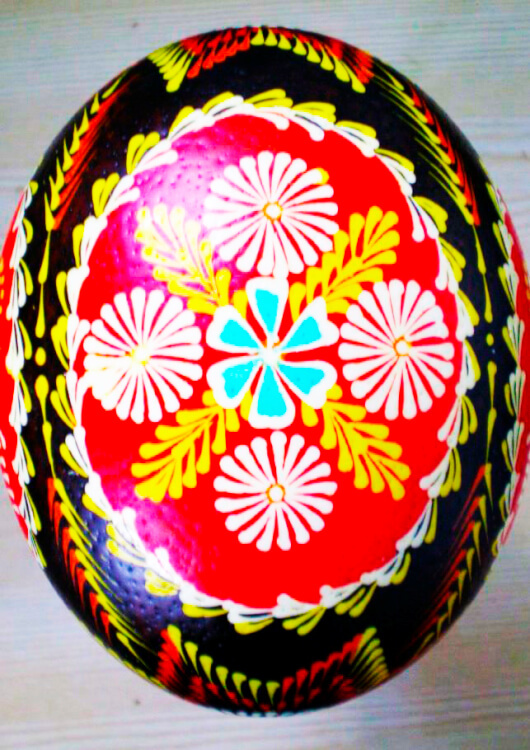 Dnipropetrovsk pysanky successfully combine geometric and floral ornaments in saturated colors. 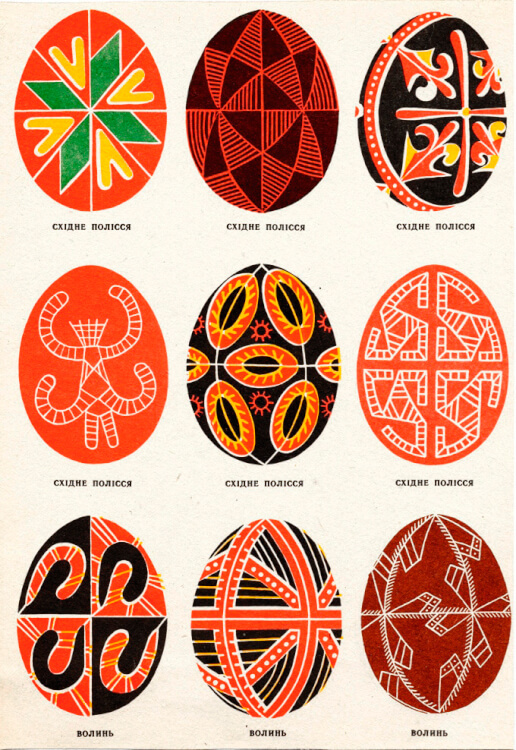 Solar motifs and watermarks are distinguishing ornaments on Easter eggs of Cherkasy region. 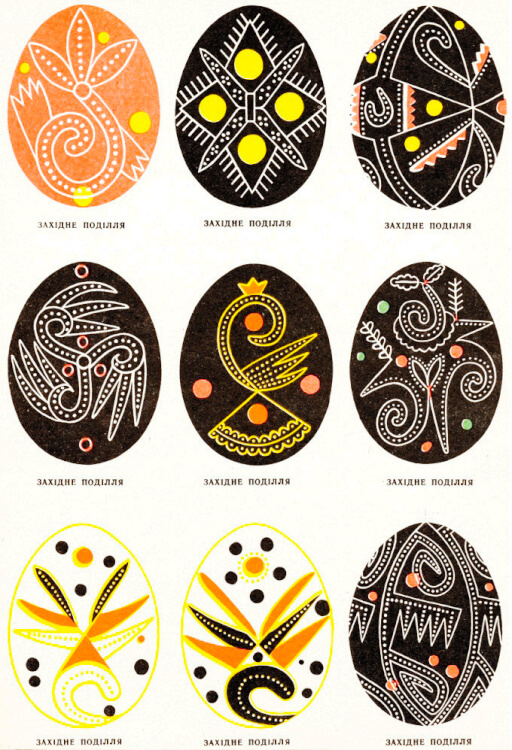 The rising sun as a symbol of a new life is most often depicted on these eggs. 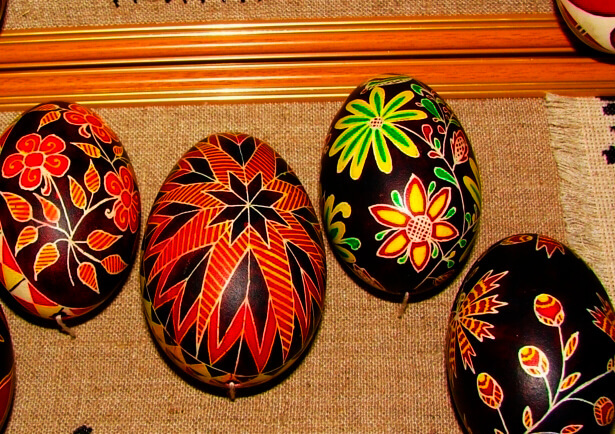 Pysanky of Ternopil region are decorated with waves, doodles, spiders and flowers. 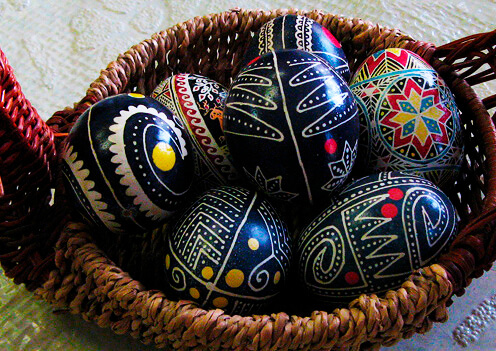 Also, black pysanky with white, blue, and yellow (sometimes red) colored ornaments are widespread here. Volyn region pysanky are divided into several paired fields featuring windmills, rakes and spirals, on a cherry or green background. The ornaments have yellow, orange, red, white, or pink colors. 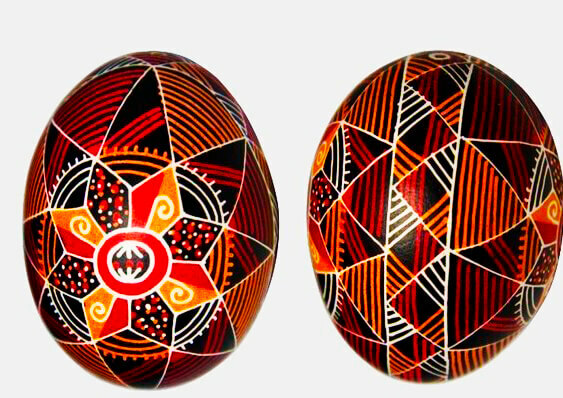 Pysanky have combinations of geometric and floral ornaments: symbols of fertility, earth and water (triangles, lattices, wavy lines). 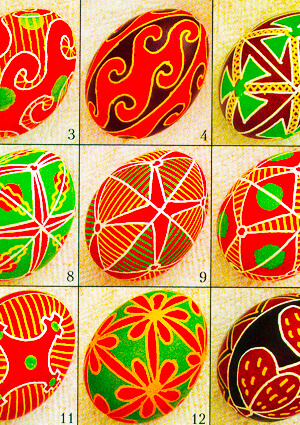 Pysanky of Lviv region have geometric patterns (triangles), solar motifs and floral ornaments. Some have images of birds, crosses, and water symbols. Detalization and detailed figures are peculiar for Lviv pysanky. 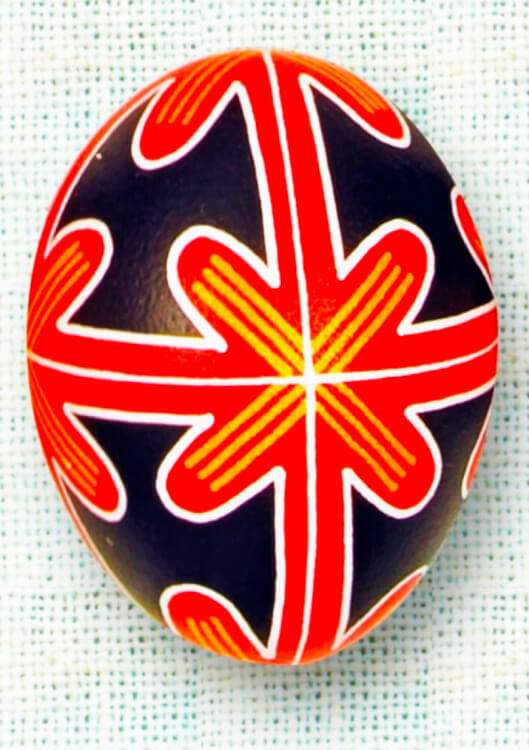 On Zhytomyr region pysanky there are floral motifs and mirror symmetry (the Easter egg is often divided into four parts there are reflected). The most common ornaments are bells, tulips and roses. 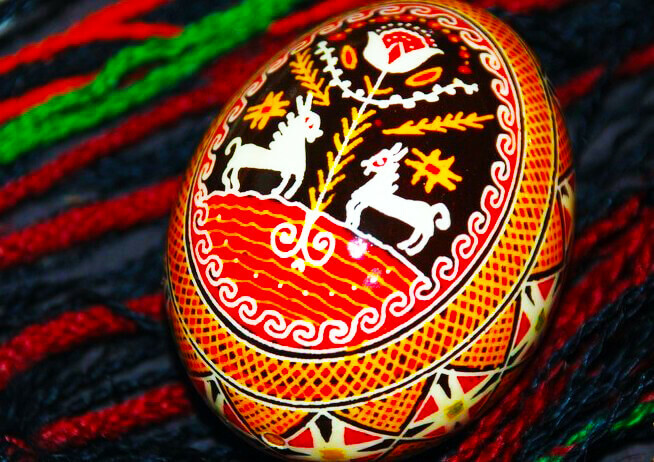 Pysanky of Rivne region usually have geometric and floral motifs, and images on a green or red background. The colors of the ornaments are white, red, yellow, and green. 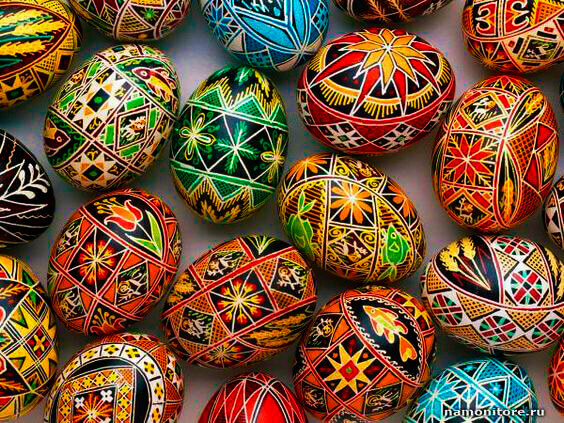 In Vinnytsia and Khmelnytskyi region, pysanky have bright geometric and floral ornaments of a fairly large size. A certain “roughness” of execution and forms is typical to these Easter eggs. You can see these in ornaments: parallel lines (water symbol), zigzags, spirals, doodles, and broken crosses. 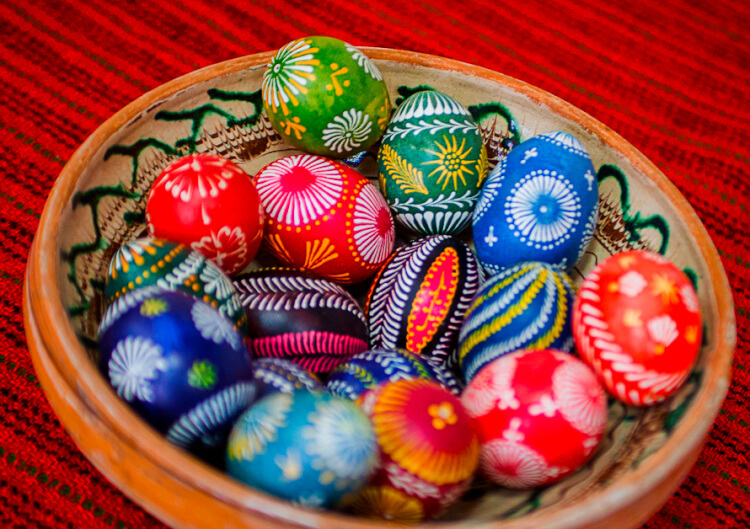 Pysanky of Sumy region are traditionally divided into two parts (each one has the same image). Solar signs (stars, sun) are peculiar to this region. 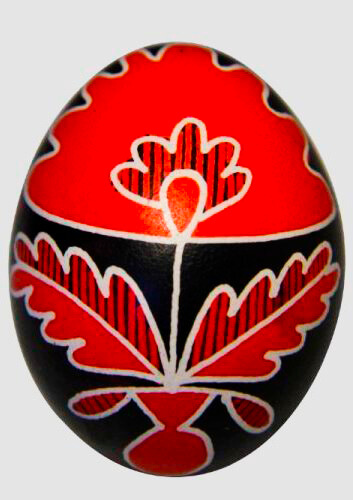 The colors of the ornaments are red and white (the background is often black as Ternopil pysanky have). 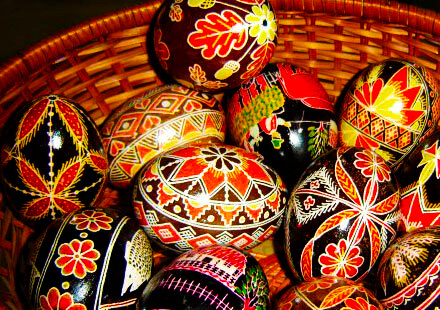 Kharkiv region pysanky are dyed in dark colors: black, dark red or green. Ornaments have calming colors: brown, yellow, white. The most common symbols are oak leaflets, tulips, roses, and stars. 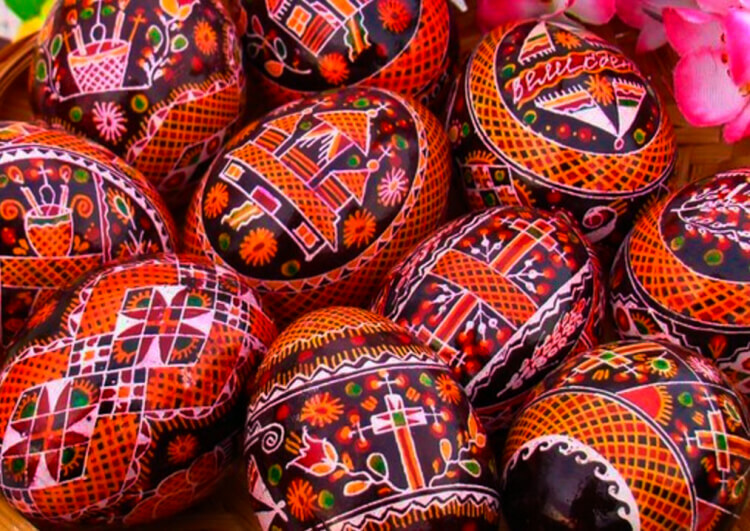 Pysanky of Southern Ukraine are characterized by bright and contrasting colors, large drawings with a small number of details. They feature geometric motifs combined with floral symbols. 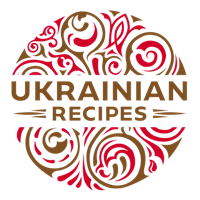 Have you liked the article about Ukrainian pysanky?